Syunik Airport (Armenian: Սյունիքի օդանավակայան, translit. Syuniki’ odanavakayan) (IATA: TBA) is located 4 km (2.5 mi) east of Kapan, the sixth largest city in Armenia, and the largest city in the province of Syunik. The airport is currently under construction, and it plans to open in June 2018 The goal of the airport is to link the cities of Kapan and Yerevan in just 40 minutes, in contrast to the five hour drive required today, and in the future to link other cities in Armenia and possibly Nagorno-Karabakh. The construction status is uncertain because of the 2018 revolution in Armenia. The airport originally started as an airstrip in the 1940s receiving occasional flights operated by Soviet Antonov 2 aircraft. However it was only officially opened in 1972 when scheduled air services commenced. In July 1971, it was decided that the city of Kapan was in need of an airlink to the capital Yerevan. However, due to the challenging topographical location of Kapan, the location was deemed too dangerous and the whole plan was cancelled. Following negotiations with the Soviet authorities and the Communist party, it was agreed that an Ilyushin Il-14 aircraft would be sent to test the airfield. In the following months, slight modifications to the runway and the installation of radio equipment were made, allowing the airfield to be operated with higher safety standards, and by mid 1972, scheduled services commenced between Yerevan and Kapan. As planned, the flights were all operated by Yak-40 aircraft. Operations at Kapan Airport were quite challenging, as the published approach was for aircraft to fly into the nearby Voghji River valley, descend under the clouds and perform a left turn to line up on the runway. However, this did not hinder operations, and Kapan Airport even saw 10-12 daily flights at times. Following the collapse of the Soviet Union in the early 1990s and the subsequent Nagorno-Karabakh War, Kapan Airport fell into disrepair and has not been utilized since. In 2013, talks to reopen the airport began between the governor of Syunik and businessmen from Armenia and abroad. Due to the dismissal of the then governor, negotiations died down, only to be restarted in 2016 and finalized in 2017, in time for the start of the construction. The price for the reconstruction of the airport is valued at $2 million Dollars, and it will allow people to fly between Kapan and Yerevan for only 20,000 Drams ($42 Dollars). 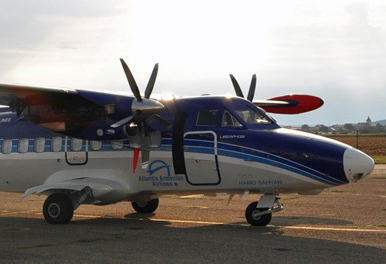 The current plan is to purchase a Czech-made LET L-410 aircraft in order to operate the flights, which will be restricted to daytime Visual flight rules.